As I depart on this adventure to the amazing and beautiful landscape of Baffin Island on what will no doubt prove to be an incredible experience, please take a moment to reflect on some of my reasons for doing so. I have experienced physical and mental injuries due to my military service that continue to affect me to this day, but am still able to lead a productive life and have a fulfilling career. Many of my friends and colleagues have not been so lucky. The money that I and my teammates have raised will go to support veterans, serving members, and their families, as well as those who have been left behind. Thank you to all who have donated thus far. If you haven't yet, and are able to, it's still not too late; please consider making a small donation or forwarding this on to your friends, families, and fellow supporters of the Canadian Armed Forces. Thank you!!! 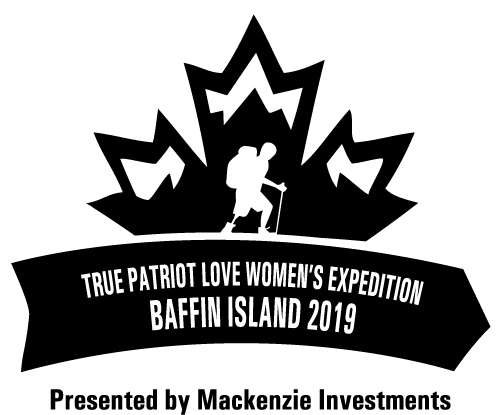 I am participating in the first ever women's only True Patriot Love Expedition: BAFFIN. Our team of servicewomen, female Veterans, and businesswomen and community leaders will trek 100 km via snowshoes across Baffin Island, all while pulling our own sleds comprised of approximately 65 lbs of gear and consumables. Our journey will take us from Qikiqtarjuaq, NU, back across the Arctic Circle, traversing the Akshayuk Pass, to Pangnirtung. Our goal is not only to finish together but to raise $1 million to fund mental health and Veterans transition programs across the country. I am a currently serving officer in the Royal Canadian Air Force, now in my 20th year of service. Over the course of the last two decades I have seen attitudes change drastically with respect to mental health. Acceptance and support for people experiencing mental health challenges have improved both within the military and amongst the general public, but there still remains a long way to go. Each year during Bell Let’s Talk Day, friends and colleagues speak candidly about mental health struggles, and are embraced and supported by their peers. This has not always been the case, and a single day devoted to recognizing mental health is not enough. Our goal should be to have mental health spoken of as matter of factly as a broken limb every day of the year, and to have equal or better access to mental health services as we do to physical health services. The nature of military service leaves us open to various service-related injuries such as Operational Stress Injury/Post-Traumatic Stress Disorder (OSI/PTSD), and other forms of trauma. As well, it needs to be recognized that trauma often affects women differently than men, particularly as female soldiers are more likely to encounter Military Sexual Trauma (MST) than their male peers. In addition to raising money that will go towards research and future programming, I am also raising awareness for the need for increased access to mental health services and programs, particularly those that address the specific needs of women and MST survivors. Will the money I donate pay for your trip? No, the expedition costs are covered and none of the fundraising is going to cover my expenses. The money raised by me and the other participants of this expedition will go towards much needed research and support programs across Canada. Since 2009, True Patriot Love Foundation (TPL) (www.truepatriotlove.com) has provided more than $25 million to fund innovative research and support 750 community-based programs across the country. By addressing the unique challenges resulting from military service including mental health, physical rehabilitation, transitioning to civilian life, and the special needs of children, TPL has helped change the lives of more than 25,000 military families, and helping more every day. Who else is doing this with you? Female military veterans and serving members, and strong, committed women from a variety of leadership backgrounds in business and the community. I've never heard of True Patriot Love Foundation...who are they and what have past expeditions achieved? Since 2012, TPL has produced ambitious expeditions around the world, raising $7.5 million in funding for Veterans' transition programs. Funds raised have allowed for enhanced job training and recruitment, provided 144 Veterans with rapid job placement, helped to fund more than 8,400 hours of peer-to-peer mental health counselling, and allowed for a $500,000 investment to create a virtual reality therapy program for Veterans living with PTSD, which is now being used across the country. How did you get involved with the True Patriot Love Foundation? I am the Patron of an Ottawa-based non-profit organization, Women Warriors’ Healing Garden. We support female veterans, Canadian Armed Forces members, and first responders who have experienced or are experiencing mental and moral injuries as a result of their service, including PTSD and MST. In 2018, we were fortunate to be among the first recipients of the Captain Nichola Goddard Fund through the True Patriot Love Foundation. This generous grant has supported many Veterans and their families through our outreach, and peer and professional therapy programs, including our animal-assisted therapy program. Our next cohort will consist of affected members of the LGBTQ2+ community. I will be updating my training progress on social media, and would gladly appreciate any encouragement and tips you can provide as I prepare for this once-in-a-lifetime expedition. Most importantly, please also consider making a donation. I really hope to make an impact with your support. If you are not able to make a donation please share my page with your family, friends and co-workers. Please sponsor me and help make a difference. *Please note that donations are not used to cover my participation costs.